Ice cream van rentals for all events, shows, parties, Jubilee celebrations, special occasions, sporting events, private bookings corporate hire and rental throughout London, Kent, Sussex, Essex, Surrey, Herts, Middlesex, Buckinghamshire and Hampshire covered. Thamesmead, Abbey Wood, Plumstead, Woolwich, Bexleyheath, Barnehurst, Charlton, Shooters Hill, Welling, Lewisham, Croydon, Bromley, Beckenham, Herne Hill, Crystal Palace, Honor Oak, Eltham, Kidbrook, Grove Park, Chistlehurst, Lee, Northumberland Heath, Gypsy Hill, Tulse Hill, Kensington and Chelsea, West Heath, Bexley, Chatham, Crayford, Catford, Hither Green, Joyce Green, Wilmington, West Wickham, Dulwich, Petts Wood, Sidcup, Rotherhithe, Slade Green, Penge, Mottingham, New Eltham, Sydenham, Temple Hill,Meopham, Mitcham, Old Street, Commercial Road, Shoreditch, Barbican, Docklands, Erith, Belvedere, Ashford, Gillingham,Chatham, Rochester, Medway, Swale, Gravesend, Dartford, Swanley, Maidstone, Malling, Faversham, Herne Bay, Canterbury, Folkestone, Dover and all areas in Kent. 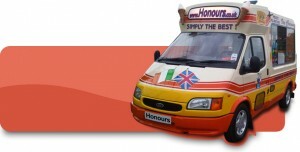 Honours ice cream van rentals for all events throughout London and the south east. We have an excellent range of soft and scooped ice creams that will have your guests indulging from our selection of delicious flavours. Our most popular product is the soft whip vanilla 99, classic favourite throughout the ice cream industry. Hire Honours Ice Cream for your event, we will provide a first class service and a wide variety of products that will help make your event a memorable and successful day!